A Tuscan church and monastery in Augustinian care since 1280 AD. Just a few miles down the road from Siena (its much larger neighbour) lies the enchanting San Gimignano. San Gimignano is a famous small town of 7,000 inhabitants (but no large tourist hotels) in Italy. With its famous towered skyline and city walls, and there are few places that evoke the atmosphere of mediaeval Tuscany so powerfully. Because of its towers, at a distance on the horizon San Gimignano town seems to offer a New York skyline until you realize the difference in scale. Only thirteen of the original seventy-two towers of the fourteenth century survive - towers that represented wealth and influence more than defence and security - the higher the tower, the richer the family. It stands on a hill, 334m above sea level, overlooking the Elsa valley on the site of a small Etruscan settlement dating from the Hellenistic period during 3rd-2nd century B.C.. Its name commemorates Saint Gimignano, who as Bishop of Modena reputedly saved the town from Totila’s invading hordes in the sixth century. It is located on a hilltop in the heart of Tuscany, with a 360 degree view into the surrounding valleys of grape vines. San Gimignano has retained all its old streets, its walls, gates, palaces, strongholds and thirteen towers. It developed considerably during the Middle Ages thanks to the fact that the town was on the route of the Via Francigena, the pilgrim road (and trade route) from Canterbury to Rome, and thence to Jerusalem, from the tenth century onwards. (Other famous towns with Augustinians such as Siena and Pavia also were on the route of the Via Francigena.) On 8th May 1300 the poet Dante Alighieri gave a speech at San Gimignano in support of the Guelph (pro-Papal) Alliance in Tuscany. The Augustinian Church of Saint Augustine is plain in its exterior, and the interior is one great nave. The construction of the church, with a single nave in Romanesque style with Gothic elements, began in 1280 and ended on 31st March 1298 when it was blessed by Cardinal Matteo D'Acquasparta. What is most significant is the alcove immediately behind the main altar, where the frescoes of Benozzo Gozzoli have become the most famous set of paintings of Augustine anywhere in the world. The frescoes in the chancel representing episodes in the life of Saint Augustine were painted by Gozzoli between 1464 and 1465 with the help of two of his pupils, Pier Francesco Fiorentino and Giusto. Late last century well into the 1990s, an Augustinian brother, Fra Romolo O.S.A., was well known around the church. Not aware of the identity of the guest, he once refused to make an exception and closed the church door to exclude Prince Charles of England when he arrived late, because it was the scheduled afternoon closing time. In 1929 the town of San Gimignano was declared a protected monument. At the end of the twentieth century a new attention was focused on it, when in 1990 the town was registered in the list of UNESCO’s World Cultural and Natural Heritage. A Brief History of San Gimignano. San Gimignano rises on a hill (334m high), dominating the lush Elsa Valley with its towers. Once the seat of a small Etruscan village of the Hellenistic period (200-300 BC) it began its life as a town in the 10th century taking its name from a holy Bishop of Modena, Saint Gimignano, who is said to have saved the village from the barbarian hordes. The town increased in wealth and developed greatly during the Middle Ages thanks to the "Via Francigena" the trading and pilgrim's route that crossed it. Such prosperity lead to the flourishing of works of art to adorn the churches and monasteries. In 1199 it became a free municipality and fought against the Bishops of Volterra and the surrounding municipalities. Due to internal power struggles it eventually divided into two factions one headed by the Ardinghelli family (Guelphs) and the other by the Salvucci family (Ghibellines). On the 8th May 1300 Dante Alighieri came to San Gimignano as the Ambassador of the Guelph League in Tuscany. In 1348 San Gimignano's population was drastically reduced by the Black Death Plague throwing the city into a serious crisis which eventually led to its submission to Florence in 1353. In the following centuries San Gimignano overcame its decline and isolation when its beauty and cultural importance together with its agricultural heritage were rediscovered. The construction of the towers dates back to the 11th and 13th centuries. The architecture of the city was influenced by Pisa, Siena and Florence. There are 14th century paintings of the Sienese School to be seen, and 15th century paintings of the Florentine School. A Guided Tour of the Art in the Church. The Church of Saint Augustine can be reached from the Porta St Matteo by passing along via Cellolese. Its very simple façade still retains the characteristics of its original architectural style. The door in the main façade is not used as the entrance, instead in order to enter the Church the door on the right hand side is generally used. The interior of the Church consists of a single great nave with three ogival apses. The roof is supported by a wooden framework. The construction of the Church of St. Agostino, with a single nave in Romanesque style with Gothic elements, began in 1280 and was completed on 31st March 1298 when it was consecrated by Cardinal Matteo D’Acquasparta. The Prior Fra Domenico Strambo O.S.A, built the cloister in the second half of the 15th century and undertook the decoration of the Church in Renaissance style. Extremely interesting to see is the Chapel of the Blessed Bartolo, whose mortal remains are kept in a marble monument sculpted by Benedetto da Maiano in 1495. In 1500 Sebastiano Mainardi frescoed the Chapel’s walls and vaults. Its terracotta floor is the work of Andrea della Robbia. Above the High Altar dominates "The Coronation of the Madonna and the Saints" painted in 1483 by Piero del Pollaiolo. The frescoes in the Chancel representing episodes in the life of St Augustine were painted by Benozzo Gozzoli between 1464 and 1465 with the help of two of his pupils, Pier Francesco Fiorentino and Giusto d’Andrea, who also painted the votive fresco of St Sebastiano. Other notable works of art in this church are the fragments remaining from a fresco by Bartolo di Fredi and a fresco showing "The Madonna" painted by Lippo Memmi in 1317 as well as the tablet representing "The Madonna and the Saints" painted by Fra Bartolomeo in 1530 and, in the sacristy, a wooden Crucifix dating from the 15th century. History of the Augustinian Monastery, San Gimignano. In the year 1272 Augustinian friars settled about five kilometres outside of San Gimignano in a small village called Racciano. This land was a gift to the Order from "Brosius quondam Michaelis," a benefactor in Tuscany. This is known because on 9th July 1272 the Augustinian Prior General, Clement of Osimo O.S.A., wrote a letter, which still exists, that accepted the property. The house at Racciano met with difficulty because the area was often pillaged by troops from the nearby Republic of Pisa. Also because they were experiencing financial difficulties there, the friars in 1280 asked if they could move within the protection of the city walls of San Gimignano that were being constructed at that time. Permission was granted, and the planned walls were widened at their northern section to include the Augustinians. The house at Racciano became a dependency of the monastery Sant'Agostino in San Gimignano, and was finally abandoned. The town council of San Gimignano donated fifty bushels of slaked lime and 20,000 bricks for the construction of an Augustinian house (convento) that actually had one of its sides incorporated into the city wall. Whereas Saint Augustine's church was blessed in 1298, the three sides of the convento that with the church now define the quadrangular cloister (clausura, patio) were constructed in 1465. Credit for building the cloister goes to the Prior Fra Domenico Strambi O.S.A., a theologian and patron of the arts. Strambi also decorated the church in Renaissance style. Notable Augustinians born in San Gimignano include Guiseppe de San Gimignano O.S.A. of the 14th century, who is one of the Blesseds (beati) associated with Lecceto, and Domenico Strambi O.S.A., the theologian and patron of the arts who was responsible the Renaissance works of the San Gimignano monastery. There is also Brother Pietro Giraldi O.S.A. (died 1381), who is buried beneath the stone set into the floor just inside the door of the church. The monastery was taken over in 1863 by the Italian government, as were almost all religious houses. It was used by the Bersaglieri division of the Italian Army. (The former Augustinian monasteries in Perugia and at Santo Spirito in Florence are still used by the army.) In 1927 the government allowed the Order to return, but the site still remains government property for which the Order pays rent. The Augustinians who arrived in 1927 included Brother Giuseppe Frediani O.S.A. and Father Giuseppe Nannini O.S.A., who were uncle and nephew respectively. In the Second World War some of the convento was used by the Fascist SS, and it was where these "Repubblichini" detained and interrogated the townspeople. A police station of Carabinieri remained in part of the building until 1958. During the aerial bombardments of the town in 1944 two hundred townspeople took refuge in the tunnels under the monastery. From 1948 to 1968 the convento was used as the novitiate for candidates to the Order in Italy. Today the Convento is a centre of the Augustinian spiritual tradition. It is conducted by Brian Lowery O.S.A. from the United States of America. The floor plan of Convento Sant'Agostino, San Gimignano. The architectural layout of the Convento Sant'Agostino at San Gimignano is the classical Augustinian house (convento). It is the "forma monasterii" (Latin for "the form of a monastery"). As seen above, at the centre was an enclosed internal courtyard (clausura, patio). The main door appears towards the right end of the lower edge of the above diagram, located between the foresteria and the church. An Augustinian convento (or monastery in popular terminology) always opened on to a town square where people were coming and going, selling and buying, and children playing. This is the case at San Gimignano - the Piazza Sant'Agostino. The conventual church is located along the right edge of the diagram. Along the top edge of the diagram from right to left, first there is the sacristy coming off the main body of the church. Next in line, to the left of the sacristy would come the chapter hall, where the community formally met to discuss spiritual and community issues in a Chapter meeting. This hall was always one of the most attractive parts of the monastery, with its gothic windows looking out into the cloister, and with ribbed arches in its ceiling. After the chapter hall would come the "calefactorium", or common room. Here the members of the community spent time together in conversation and relaxation. It had a fireplace in one of its walls, and was the only room that was heated during winter. To its left was the "silentium", or atrium with its stone "lavabo" and brass faucets (now in the sacristy), where the members washed their hands before entering the adjacent "refectorium" (refectory, dining hall). The kitchen was nearby, as were the "cellaria" (cellars) and store rooms for grain, wine, firweood, and animal stalls. On the fourth side of the complex was the two-storied "foresteria" or hospice, for guests and pilgrims. Its entrance was beside the main door of the complex, so that guests could come and go without disturbing the life of the community. The community lived on the second floor of the monastery, above the refectory, kitchen, and cellaria. As already mentioned above, the whole monastery was taken over in 1863 by the Italian government, as were almost all religious houses. It was made into the barracks for the Bersaglieri division of the Italian Army. In 1927 the government allowed the Order of Saint Augustine to rent and occupy three sides of the convento. The fourth side (called the foresteria) was granted to Augustinian use soon after the year 2005; prior to that year it had been used by the government for document storage. Any telling of the Augustinian history of the Augustinian church in San Gimignano cannot proceed very far without making mention of the artist most famous for his fresco series on the life of Augustine, Benozzo Gozzoli (1420 – 1497 AD). He had been born in Florence in 1424, or perhaps 1420. In the early part of his career assisted Fra Angelico, whom he then also worked in Rome and Orvieto. He then worked as an assistant artist in Rome, Viterbo, Montefalco and Perugia before receiving a major commission in his own right in his city of birth, Florence, at the age of thirty two years in 1456. It was a coveted commission to paint the private Medici Chapel brought Gozzoli back to Florence. Stimulated by the prestige attached to this commission and the abundance of materials at his disposal (including gold), Gozzoli created one of the most fascinating fresco cycles of Florence in the 15th century. Over the entire choir of the church, a triple course of scenes from the legends of Saint Augustine, from the time of his entering the school of Tagaste on to his burial, seventeen chief subjects, with some accessories. Some of these scenes are also found in a limited number in essentially a similar manner in various other Augustinian churches. This has led to the suggestion that the selection of these nineteen particular frescoes was overseen by a learned and reforming Augustinian friar as an example and exhortation to the members of the Augustinian convento, who were the ones who would be viewing these frescoes daily. Gozzoli was given the commission the Prior (the Augustinian superior) at the time, Domenico Strambi O.S.A. Strambi had in 1449 had been given a grant by the town of San Gimignano to study theology at the Sorbonne in Paris. The paintings were produced within the contemporary context of the reformation of the monastery of Sant'Agostino. Gozzoli was a skilled technician rather than a greatly creative artist, who reproduced "pretty pictures" on canvas or on wet plaster that captured a photographic and everyday reality rather than any classical flight of the imagination. His art does not rival that of his greatest peers either in creativity or dramatic impact. Instead, the art of Gozzoli is memorable and attractive by being rich in colour, winning, lively and packed with the details of the daily life of his wealthy patrons in Italy of the fifteenth century. His patrons could happily have walked into the painting or fresco and felt at home there. The people depicted are happy, graceful and dressed colourfully in the fine clothing of Florentine nobility. There is no sign on any real pain or tension in their appearance or actions. The countryside is painted as filled with birds and horses, and interior scenes often feature a dog, large or small. In fresco painting he used the methods of tempera, and his work has decayed accordingly. For the Augnet gallery on the Augustinian history of San Gimignano, click here. 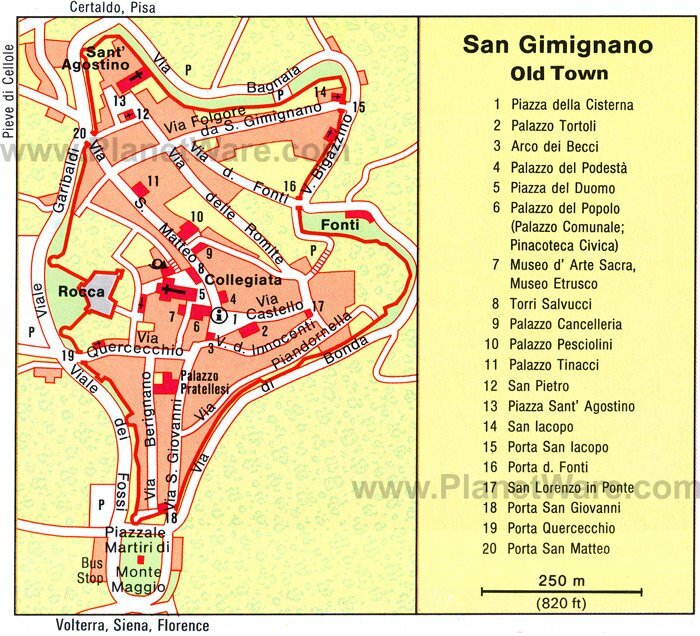 Street Map of San Gimignano. In this image, the Church of St Augustine is right at the top of the picture. St Augustine on the walls. Scenes from the life of Augustine as depicted in the frescoes at San Gimignano. A website by John Immerwahr, a teacher of philosophy at Villanova University. Pictures of Church of St Augustine, San Gimignano. Two files from the same German source in May 2006. Great photos. The fresco cycle of Saint Augustine in the Sant'Agostino, San Gimignano (1464-65) by artist, Benozzo Gozzoli. Chiesa di Sant'Agostino, San Gimignano. The way the frescos really look! A photographic walk through San Gimignano. Planning to travel to San Gimignano. Sanctuary of Church of S.Agostino, San Gimignano. Photo by Q.T. Luong. Tourist Coverage of San Gimignano. In English, with excellent photographs. The Gozzoli Frescoes. The San Gimignano frescoes of St Augustine explained. Six Views of San Gimignano. By Jay Pulli. Paradoxplace. A huge and very pictorial site on the Middle Ages, especially in Italy. It also contains helpful chronologies of the Middle Ages. Obviously a labour of love, this site deserves to be bookmarked! For Paradoxplace images of the town of San Gimignano, go to http://www.paradoxplace.com/Perspectives/Italian%20Images/Montages/Other%20Tuscan%20Towns/San%20Gimignano.htm.